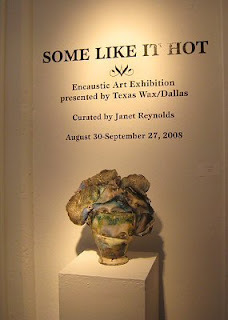 Carolyn and I traveled to Dallas Saturday to go to the opening reception of the “Some Like It Hot” show we have work in at the Bath House Cultural Center. It’s a great place to have a show on the banks of White Rock Lake in east Dallas. The reception was packed with lots of people interested in the encaustic technique as well as a lot of people coming in to see the Women Printmakers showing in the adjacent gallery. Looking forward to sharing encaustic painting techniques, some of our TX Wax Dallas members are preparing for demonstrations of their personal techniques during the DADA art walk on September 13. Right now Flikr says “We have a problem, Houston” for my uploads of photos…so maybe later I can get some up from the reception or send them to some other member of our group to post. 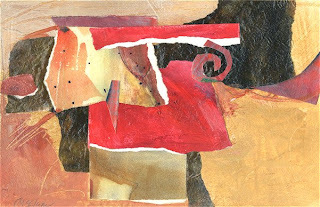 I donated a small collage to the local art museum here in Longview this week. It’s framed and everything………SO, if anyone is interested in bidding on it. Or, just look around for other great items to bid on to support my local art museum. 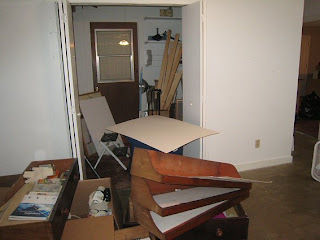 I was going to call this….”Farm Studio Move, Day 2″, but it looks more like “leaving the old studio, day 2” to me. Bright and early this morning, Curry knocked on the door and had the old pick-up truck parked in the driveway. He was ready to mow our lawn (boy did it need it), wanted some coffee and breakfast, and started with dismantling more studio stuff. The poor room looks even more derelict than before now. The big English wardrobe I found some years ago holds so much stuff….he’s always hated it and calls it the “monstrosity”. I keep telling him it’s a great find and holds so much where I can find it and helps me stay a little more organized. Now it’s just a shell waiting for the parts to be taken away…..top and bottom all in one piece and the rest can be dismantled for moving. It does pose a problem for placement I have to admit, as it’s 7 ‘ tall and 7 ‘ wide. That means there are two walls in the new studio….and one is for the painting pegboard easel wall. 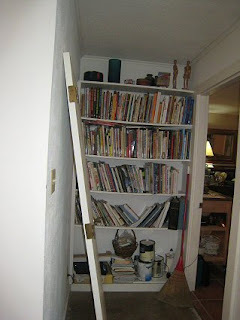 I’m trying not to even think about all the old paintings I need to throw out or do something with in that closet. Some I hate….I tore two up today. But some are just not what I do any longer and so they will not be seen in a show so how are they going to find a home??? My oldest daughter went “shopping” there in the studio the last time she was here. I don’t think my youngest daughter or son really care that much for abstract art……oh well. I am going to donate one to the museum auction for later this month. Now I have to make time to get it down there in time. I keep saying….simple, simple, simple…less is more, less is more. Clean, clean, clean! Oh my gosh…I have to pack up all those books, too. I knew it was coming but it really hadn’t sunk in. I’m moving out to the farm. I’m moving my home studio after 24 years and my home after 40 years. What an upheaval this is…but I hope a good one. I know there will be days (already have been) of exhaustion from the stress both mentally and physically. Ain’t no spring chicken any longer……Also much time if you let it second guessing the decisions. I told my husband, lets just do it, we can always sell if it’s too much later on. While only about a third of my junk has been thrown down all over these rooms, it now really means this is going to take place soon. I NOW HAVE MY PAINTING WALL INSTALLED. It’s been a couple of days of cleaning. 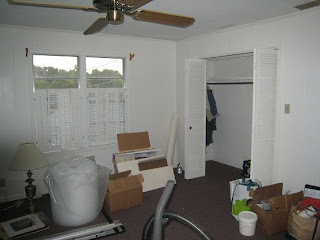 Most of these pictures were taken in process so try to look over all the dusty corners and bad looking vinyl floors. 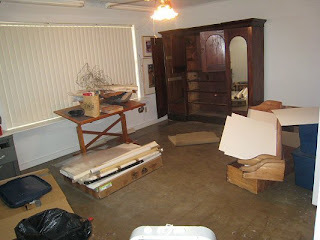 The carpeted room is in okay shape except for the step down into the painting room….cats had their way here it seems. I’ll figure out something to do about it later. For now the old vinyl will just be scrubbed as much as possible and paint drips can cover the rest in time. Who can complain to get three rooms and a tiny bathroom for their studio? And the view down the hills, pastures to the lake will be inspiration for me for sure. I’m including a link to the Flickr folder to see all the beginnings. Hopefully later on I can post more when all the furniture and other “stuff” gets installed.